Ryan Johnston has enjoyed the privilege of guiding anglers since 2003. Over the years, Ryan has witnessed how fly fishing can foster important relationships for him and others. Time spent fly fishing together creates a special bond between people. When a person considers the beauty of the land, the soothing flow of the river, and the exhilaration of trying to catch the fish that live in the river’s cold waters, it is no wonder that people come together in a special way on the river. Each day on the river is unique, holding its own special memories that last forever. Ryan’s father taught him that each day on the water is a gift from God, and we must be grateful for the opportunity to live in a country where we have the freedom to pursue our passions. So of course, Ryan’s passion is to spend time fly fishing with those he loves. Through divine inspiration, he has created Cast Hope, an organized method of blessing others with the joy and bonding of fly fishing. It is his dream to deepen relationships, teach fly fishing, and create stewards for the environment. Todd “Slim” Cancilla has been a fly fishing guide since 1993. The first twelve years of his guiding career were spent probing the famous San Juan River in New Mexico. He was blessed with great success there and a large following of anglers. But to be closer to friends and family, Slim moved to Redding, California in 2004 to guide the great waters of Northern California. In this short span of time he has quickly become one of the premier guides in the region – not surprising considering his experience, giftedness, and passion. He is a great instructor, expert rower, and phenomenal fisherman, so of course those who fish with Slim quickly gain proficiency at fly fishing. His great love for God and people makes a day in Slim’s boat full of laughs, great stories, and a sense of genuine friendship. It’s no wonder that Slim easily became Cast Hope’s go-to guide. His eagerness to donate trips has made it possible for this organization to impact many lives. Hogan Brown began fly fishing from an early age. He virtually grew up on the banks of the North Fork and Lower Yuba rivers in Northern California. Since he was a kid the rivers and ponds have been his play ground. Lots of time spent chasing trout and bass have led him to become one of the best guides in the region. Hogan guided full time for 10 years but now is a high school teacher at Hamilton Union High School. Through dedication to the sport he now only guides part time as he balances his teaching and family life. Cast Hope is lucky to have Hogan on the weekends and during the summer. He is a living example of how fly fishing can positively make an impact on one’s life. Here at Cast Hope we call Hogan “the bass man”. He specializes in warm water bass fishing in the Sacramento River as well as various private ponds. Hogan knows the ins and outs of warm water fly fishing and has a nose for sniffing out the fish. Anyone will tell you that a day spent with Hogan is relaxing, fun, and full of great fishing. Hogan’s warm smile and down to earth mentality made him a great addition to the guides of Cast Hope. His willingness to guide for Cast Hope has allowed this organization to make an impact on the people of Northern California. Mike specializes in guided fly fishing trips on the Trinity, Lower Sacramento, and Klamath rivers for rainbow trout and steelhead. Mike has been fly fishing these rivers for 20+ years and knows each bend in the river like the lines on his hand. He is a very patient and friendly guide who enjoys sharing his knowledge of these fisheries with customers and kids alike. It is his goal to give people the best possible experience on the water, and to leave their trip with life long fishing memories. Mike has been a great addition to our growing guide staff and has quickly become the favorite guide for many of our youth. We feel lucky to have Mike helping out with the organization. Darrin is a full time fly fishing guide from Chico, CA. He can be found rowing famous Northern California tailwaters and freestones such as The Lower Sacramento River, Yuba River, and the Pit River in pursuit of trout. Darrin spends his late fall and winter focusing on Steelhead venues such as the Trinity River, Feather River, Klamath River, and various coastal rivers with single hand and two handed rods. Darrins takes pride in showing any angler in his boat a wonderful time. Darrin is currently chipping away on his bachelors degree is Criminal Justice in hopes of becoming a Fish and Game Warden or a stay at home Dad. Darrin has a fun loving heart for youth and he always has a smile. The pure joy of fishing is sensed anytime you have a conversation with Darrin. This is one of many reasons why kids love learning how to fish from him. Aaron is a full time guide from Redding, CA. He is an awesome guide who totally loves being outside. Aaron is always on the go fly fishing, hunting, and camping. Of all the Cast Hope guides this guy is outside more than anyone else. Aaron is a guide on many Northern California streams and knows lots of "secret spots" since he grew up in the valley since a kid. We are lucky to have this guide on our team. Anthony Carruesco is a Northern California native who grew up exploring the streams and rivers of the North State fishing for trout and steelhead before pursuing his career as a Lower Sacramento River fly fishing guide. He is a recent graduate of Sonoma State University with a degree in Environmental Science with an emphasis on conservation and restoration. Anthony held an internship with the Salmon Protection and Watershed Network (SPAWN) and conducted two years of research on Pacific Salmon and steelhead population declines with a focus on the reasons and solutions. Since Guide School, Anthony has spent summers guiding in Alaska at Wilderness Place Lodge and currently at Kulik Lodge. During the Fall, Winter and Spring months, Anthony calls Redding, CA home. Anthony’s passion for fly fishing and the outdoors is infectious and his easy going personality and exceptional technical skills are appreciated by all. Ryan’s guiding career began back in 2005 on Putah Creek while working for Sweeneys Fly Shop in Napa. He never had a chance to stay guiding due to health issues and then college. But now, he’s back at it and as serious as ever. With 14 years of Nor Cal fly experience, he’s been pursuing fish here with a great passion the majority of his life. As an angler and guide, Ryan is constantly pushing his limits, studying new species or scheming up new ways to get to fish. He admits that Fly Fishing has absolutely consumed his life. In his off time, It's safe to say he’s preparing for his next trip in one way or another. Ryan loves the diverse fishing opportunities here in the North Valley and he is very proud to call this area his home. Toby is the most veteran of all our guides on the Cast Hope staff. He has literally been fishing the Northern California waters since the 80's. His uncanny ability to find fish mixed with his laid back attitude make him a perfect addition to teach fly fishing to underserved youth. Toby is our American River expert and will be teaching many of our Sacramento based kids. Dave is one of our Yuba River experts. He literally grew up on the banks of the river and knows the Yuba like the back of his hand. Dave will be guiding kids on the Feather, Yuba, and American Rivers. Many of the Sacramento based kids will be lucky to spend a day in Dave's boat. Dave is all about teaching and having fun. From lakes and rivers of Texas, E. Tennessee & N. Georgia, bayous of SW Louisiana or the inshore/offshore salt and freshwater of Florida, Ragan grew up chasing fish. With a cajun mother and Florida boy father, both avid anglers, he held a rod early on and though the Ragans moved often due to his father’s profession as a pro golfer, the road always ended in water. Aside from their parents, Chuck and brother Paul fished aside paternal grandparents on the intercoastal of Daytona Bch. and maternal grandparents along the Blanco River outside of Kyle, Tx. Fishing became a way of life in the family before sport. Father Dave Ragan always seemed to relocate the family around prime fisheries whether he meant to or not and having a mama teach catching and cleaning before most kids see a knife didn’t smother the flame either. As a teen, he fished beaches, inlets and canals on the Gulf of Fl. and worked for the non profit Life Program, counseling troubled youth. With itchy feet in 94, he left for Gainesville unknowingly continuing what would end up being his music career. As his band Hot Water Music became an international touring machine, Ragan saw the world. Moving to Micanopy in early 2000, he learned from Kip Street & Bill “The Gill” Sorton, new methods of angling and woodwork. When not working, you’d find him off the coast of Cedar Key or Shellmound chasing Redfish, offshore winching grouper or poling lilies after heavy bass and striper on Rodmans, St. Johns or the Suwannee. In 04, Ragan left the South for California to marry Jill and continued a trade in carpentry, songwriting and fishing Pacific waters. He kept touring, this time with fishing rods in tow. As an angler and traveling musician, Ragan takes advantage of being in prime zones to fish and share music across the globe. Relocating to N. Ca. in 07, he continued his career and had his first child and future deck hand, Grady. 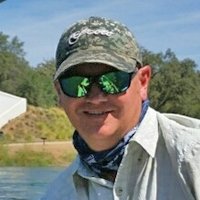 Now as a fishing guide, Ragan loves sharing fun and joy on water in pursuit of largemouth, smallmouth, carp and spotted bass on the fly and the wild trout of the Yuba River. Always positive and fired up, he lives to see people light up when their rod bends and believes in giving others the knowledge of the outdoors, fly fishing, teamwork, independent confidence and the importance of respect and conservation for all to carry and pass on themselves. Jordan grew up just minutes from Putah Creek, in the town of Winters. He eventually moved to North Lake Tahoe to challenge himself on the beautiful streams and lakes the Sierra’s had to offer. In 2009 he decided to turn his passion into a career and attended the premier Clearwater Lodge guide school. Jordan now guides many different waters in Northern California including Putah, the Yuba, Feather, forks of the American River, and is the lead casting instructor for Matt Heron's fly fishing school in North Lake Tahoe. Kayla first picked up a fly rod in high school and has since devoted her time chasing trout, steelhead, bass, and saltwater species. She will admit whole heartedly that fly fishing has become the center of her world, and spends all of her free time on the water or rowing her drift boat. Born on Oahu, she grew up walking the flats and reefs with her dad in search of trevally and bonefish. During the winter, you can find Kayla casting her two handed spey rods in search of steelhead in Northern California. Kayla is a full-time liberal studies student at CSU Chico, and has plans of becoming an elementary school teacher in addition to guiding in Northern California. Building experiences teaching in classrooms and working with students, Kayla has been able to incorporate teaching techniques into her easy-going fly fishing instruction. When she’s not in the classroom or working at the Fish First Fly Shop! in Chico, you can find her guiding the Upper Sacramento River, Lower Sacramento River, Feather River, Lake Oroville, and Deer Creek. Kayla genuinely loves instructing and finds joy in watching people appreciate the outdoors and the beautiful ecosystems fish live in. As an angler and guide, Kayla looks forward to a lifelong journey of learning and fly fishing. Brad McFall is one of California’s leading guides where he has spent almost two decades mastering his craft. He has spent 15 years guiding the Mammoth Lakes area of California during the spring and summer months, and the last 12 years guiding Steelhead and Trout on the Trinity River, Lower Sacramento River, and various other Northern California rivers during the fall and winter months. In 2016, Brad decided to move his family and business to Redding to focus on the abundance of fisheries the area has to offer. For his most discerning clients, you will also find Brad hosting trips in Alaska, Mexico, Belize, Florida, Brazil and the Bahamas. Brad currently owns and operates Mammoth Fly Fishing and Brad McFall Fly Fishing. His extensive resume includes; Clearwater Guide School Instructor, former Head Guide of the Trout Fly/Trout Fitter Fly Shop, Simms Guide Ambassador, Sage Rod Elite Pro, Hatch Reels Pro and former V.P. of the Eastern Sierra Fishing Guides Association. His major accomplishments include being featured on the Outdoor Channel’s “Familiar Waters” on two separate occasions and landing the cover of “Fly Fisherman Magazine” as well as the cover of "California Sportsman Magazine". Brad has also been featured in a variety of other major national and international magazines including; Southwest Fly Fishing, The Drake, Sierra Fisherman, La Peche, and more. Brad was also featured in Chip Obrien’s latest publication, “California’s Best Waters” and also recently appeared in “Fly Fishing the California Delta” by John Sherman and Mike Costello. Brad is a highly driven and innovative angler and guide. He delivers consistent results with a focus on exceeding expectations. He creates exceptional experiences with a promise of memories to last a lifetime. Brad’s stellar reputation, easy going personality, unparalleled dedication and professional work ethic keep clients fighting for spots on his calendar throughout the year. Matt grew up catching trout and bass in the historic Adirondack Mountains, and not long after was chasing the huge trophy steelhead, browns and salmon in the Great Lakes tributaries every fall and spring. Little did Matt know that his first rod and reel outfit in 1991 would change his life forever. After double majoring at University of Morrisville and University of Cortland, Matt would begin his full time career in fly fishing. He is a graduate of NOLS (National Outdoor Leadership School) and worked for the International Federation of Fly Fishers in Livingston Montana as his first job out of college where he also became a Certified Casting Instructor. From 2008 to 2014 Matt spent his winters traveling the countey with the Fly Fishing Film Tour. Currently Matt runs his Fly Fishing School and Outfitter (http://mattheronflyfishing.com/) in Squaw Valley and Truckee in Lake Tahoe, CA. He has quickly turned his school at Resort at Squaw Creek into one of the premier fly fishing education programs in the country. His guide staff primarily focuses on the Truckee and Little Truckee rivers on the north shore of Lake Tahoe. In the off season, Matt can be found exploring the world’s finest destination and lodges hosting trips with clients and friends. Matt resides in Truckee California with his beautiful wife Lulana and their sons Declan and Easton. Dave has fly fished since childhood. He owned and operated the Reno Fly Shop for 28 years and continues to operate a guide and outfitting business, Truckee River Outfitters, in the Reno/Lake Tahoe area. When not fishing or guiding for trout on one of the many local streams or lakes, he can be found in a duck marsh with his kids or stalking a permit on a flat somewhere in the Caribbean. Dan LeCount is a fly fishing guide in the Truckee area with a passion for the natural world. He grew up on the California coast, spending his youth exploring the hills and streams near Half Moon Bay. He started fly fishing around age 11 on an annual pilgrimage to the eastern Sierras with his father and brothers and hasn't stopped since. Dan is a contract fly designer with Umpqua Feather Merchants, a rod builder, published author, photographer and artist. He has worked in the fly fishing industry almost 17 years and is very active in many of the local watershed conservation programs. He gives dozens of talks a year on fishing the Truckee area along with talks on fly fishing tactics and ethics. He is a 4th generation fly fisher and comes from a long line of teachers. Brendan grew up in the foothills of the Western Sierras fishing for anything and everything that swims. His earliest memories go back to salmon fishing with his grandfather over 30 years ago. While in his teens, he taught himself how to cast a fly rod and to fish the rivers and streams he now guides daily and owns Alpine Fly Fishing. When Brendan is not guiding, he is usually on the water chasing trophy trout and honing his skills all over the eastern sierra and beyond with his guide dogs “Hatch” and “Woody”. His other passion is saltwater fly fishing. Brendan has fished all over the world chasing saltwater game fish. In the winter months, Brendan is the West Coast Territory business manager for Stockli skis. There’s a very good chance you’ll see him in the line up on powder days at Kirkwood or Mammoth. If he’s not skiing pow, then he’s probably fishing for Steelhead somewhere on the coastal rivers of the west. Trent Kirschner is a veteran Truckee fly fishing guide who at the age of ten picked up his first fly rod. His passion for the sport has continued ever since. He is a graduate of the highly regarded Clearwater Guide School and was brought back to the Clearwater program to guide and instruct before becoming a full time guide in Truckee. Trent also acts as a senior guide and instructor for Matt Heron Fly Fishing, a senior guide for Truckee River Outfitters and the fly fishing instructor for Tahoe Mountain Club. Trent’s knowledge and love for the art of fly fishing is infectious and he enjoys developing the skills of both beginner and experienced anglers. When Trent is not on the river he can be found teaching science at Sierra Continuation High School.